Sympathetically restored stable mews cottages in two-acre 18th century watermill complex in the peaceful hamlet of Keldholme, yet only 10 minutes walk from Kirkbymoorside. Tranquil, well-appointed accommodation with linen and large fluffy towels, TV, video, mini hi-fi and central heating included. The large bedroom containing a kingsize sleigh bed, and the bathroom with bath and power shower are downstairs. Upstairs is an open plan living room with dining area and kitchenette equipped with refrigerator, microwave, electric oven and gas hob. There is free WiFi access. We have fishing rights on the stretch of the River Dove bordering our paddocks. The large garden is also available for your use. Breakfasts can be provided in the Mill by arrangement. There is on-site parking and we are open all year. 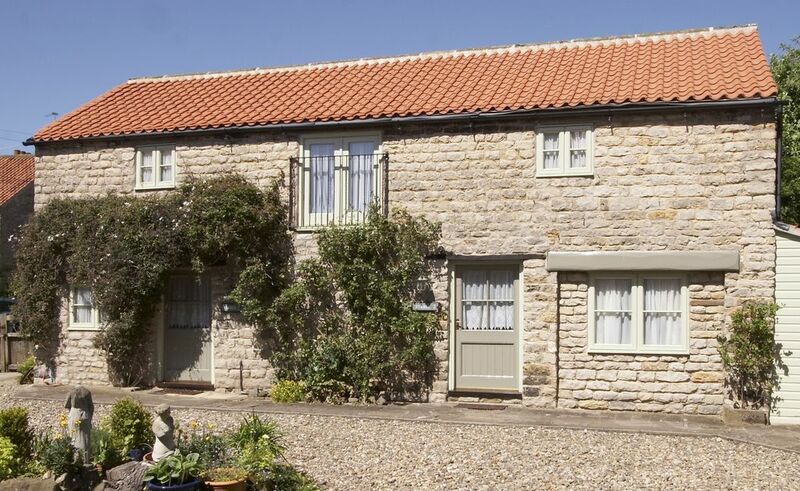 The cottage is within 15 minutes walking distance of the lovely market town of Kirkbymoorside and convenient for the North Yorkshire Moore, the North Yorkshire Coast, the Moors Railway, Castle Howard and York. We live in the converted watermill on the other side of the courtyard from the cottage and are happy to answer any questions you have about the cottage or the area. The Cornmill is in Kirby Mills, just a short (12 minute) walk from the centre of the historic market town on Kirkbymoorside and just off the A170 which runs from Thirsk through Helmsley and Pickering onto Scarborough. We are on the edge of the North Yorks. Moors, only 20 minutes from Castle Howard and 40 minutes from both the coast and the historic city of York. We have a good stretch of river frontage which means we can offer fishing to our guests who are also welcome to use our garden (next to the car park) for leisurely afternoons and barbecues. We can also offer cottage guests breakfast in the cornmill by prior arrangement and can provide laundry services for a nominal fee. Linen provided for one or two guests as standard. Additional linen can be provided if requested but may incur a charge. Free wifi is available. Please let us know if there are any signal strength issues (possible due to the thick stone walls). Large fluffy towels are provided for one or two guests as standard. Additional linen can be provided if requested but may incur a charge. The kitchen, dining and living areas are all on the first floor in an open plan layout which allows guest to enjoy a loft-style environment. You are welcome to use our large garden and adjoining paddocks. As there is quite a large (6 - 8 inches) step up into the cottage, a narrow ground floor hallway and the living area is up stairs, the cottage is not really suitable for those in wheelchairs. The cottage was perfect for a couple and had everything we could possibly need set in an area very accessible by car.The whole area was beautiful and provided all the amenities to cater for a holiday, could not fault anything. We stayed for a week at this cottage in late July. Very cosy and comfortable place, with everything we needed. The bathroom was very luxurious, with a great drench shower. Kitchen is small but well equipped, and we made some nice meals to eat in some nights. The cottage is well located for access to York, Scarborough and Flamingo Land, so perfect for a week's break in Yorkshire. The owners were friendly and live nearby for any issues - they were able to print a voucher for us. We also walked into the nearby town Kirkbymoorside, and visited 4 of the local pubs – which were all good. Its only 10mins to walk. Would definitely recommend, and stay here again. Dear Alasdair, thanks very much for your kind words. We enjoyed having you both with us and you were certainly lucky with the weather! Leuk huisje in een prachtige omgeving! Bevat alles wat je nodig hebt en is gezellig ingericht. Netjes en schoon. Zeer vriendelijke verhuurders.